Nice NS Paul. You'll need to give the winch a good workout and maybe strip it down and regrease it. I found that my Warn winch had pretty crappy grade grease in it which broke down at the first signe of water (just from washing the car). Better off repacking it with marine grade grease, then use it regularly. Well I should be sharing pics of my new NT RX Pack now, But due to a major screw up at the dealer pre-delivery, I now face up to a six 6 await for another vehicle to be supplied, but as so may have already read about this on the Pajero forum, I wont go into it again here. Nice mate, make sure you post up some action shots. Bushman wrote: Well I should be sharing pics of my new NT RX Pack now, But due to a major screw up at the dealer pre-delivery, I now face up to a six 6 await for another vehicle to be supplied, but as so may have already read about this on the Pajero forum, I wont go into it again here. Well worth waiting for though, look forward to seeing your new ride. Not an action shot but there's something about this pic that I like. Hi all. 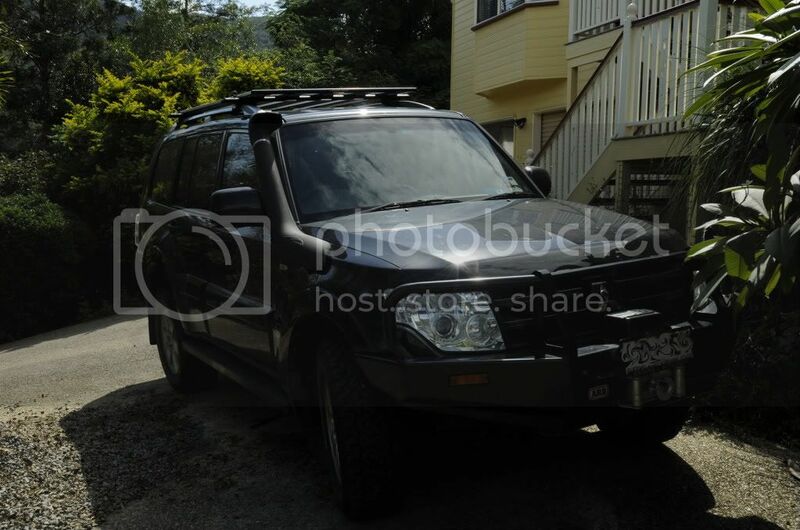 I have purchased a VRX Pajero 3.2l DiD. When the car had approx 1500 kms on the clock I took it to ARB Newcastle with my list of goodies. I have had fitted: ARB deluxe colour coded bull bar with 9500lb winch, Arb aux fuel tank, OME HD suspension lift with nitrocharger sport shocks and poly air bags in the rear, ARB dual battery system, Rhino Rak bars and roof rack, Tekonsha P3 brake controller, charging circuit to anderson plug, Tjm Airtec snorkel, original 18" wheels and tyres, Speedy 17x8.5 Baja wheels and BFG AT KO tyres for off road, GME TX 3100 radio. Coming up: Bushskinz full bash plate set and side step/sliders, Lightforce Genesis lights. apsilon wrote: Not an action shot but there's something about this pic that I like. d_c_prescott wrote: Hi all. I have purchased a VRX Pajero 3.2l DiD. When the car had approx 1500 kms on the clock I took it to ARB Newcastle with my list of goodies. I have had fitted: ARB deluxe colour coded bull bar with 9500lb winch, Arb aux fuel tank, OME HD suspension lift with nitrocharger sport shocks and poly air bags in the rear, ARB dual battery system, Rhino Rak bars and roof rack, Tekonsha P3 brake controller, charging circuit to anderson plug, Tjm Airtec snorkel, original 18" wheels and tyres, Speedy 17x8.5 Baja wheels and BFG AT KO tyres for off road, GME TX 3100 radio. Very impressive mods list d c, look forward to some pics. Off for a 5,000km jaunt around Darling River/Broken Hill/Mungo NP/Kanangra Boyd NP in June, so looking forward to giving it all a bit oif a shakedown. It's got a Paj in it! dam, didn't see this til after I posted, ah well, at least I'm not the only smart-arse. Nice Charlie, look forward to hearing all about your trip..
Guss wrote: Nice Charlie, look forward to hearing all about your trip.. Cheers Guss - can't wait for this years big trip. Seems like an age since last years desert trip. Really looking forward to it - 8 weeks to go! I have done most of the mods to the car now and decided to post a list of what has been added or changed. Old Man Emu raised HD suspension with air bags in rear and Nitrocharger Sport Shockies, ARB Deluxe colour coded bull bar with 9500lb electric winch, Sidewinder HID driving lights, ARB dual battery system, Couplertec rust prevention, Steinbauer power chip, Airtec snorkel, Bushskinz full bash plate set, Prodigy P3 electric brake controller, Hema Navigator GPS, custom drawer unit, GME TX3100 uhf CB, 12 volt power outlets in rear, charging circuit to anderson plug at rear, Speedy Baja mags and BFG A/T tyres for off road touring, standard VRX mags and tyres for around town as well as all the standard VRX equipment and features. Towing a Cub Brumby off road camper trailer personalized with our own mods and additions. d_c_prescott wrote: I have done most of the mods to the car now and decided to post a list of what has been added or changed. 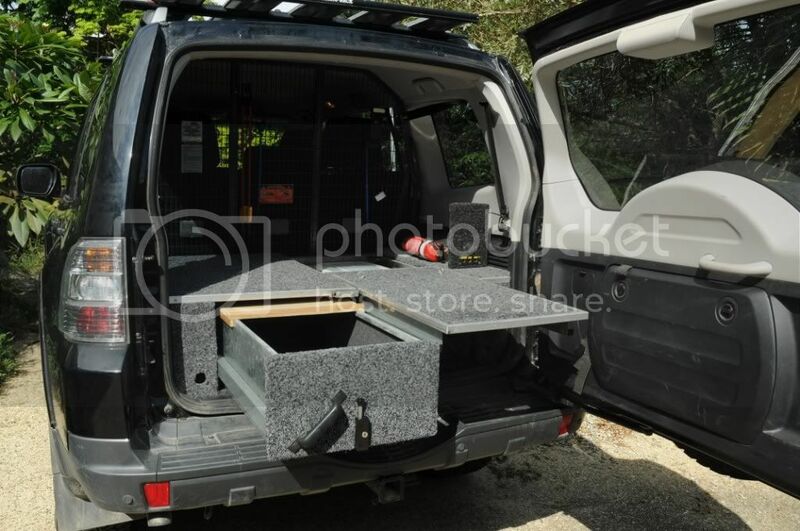 Looking forward to seeing the Pics.. reads like 1 well set up for touring/Off Road.